The celebrated guitar-duo of Strunz and Farah are no newcomers to the collision of music from Spain to Latin America and beyond. Indeed the two men have built their reputation on creating a blend of this music so eloquent and hot that it burns with an exquisite liquid fire. 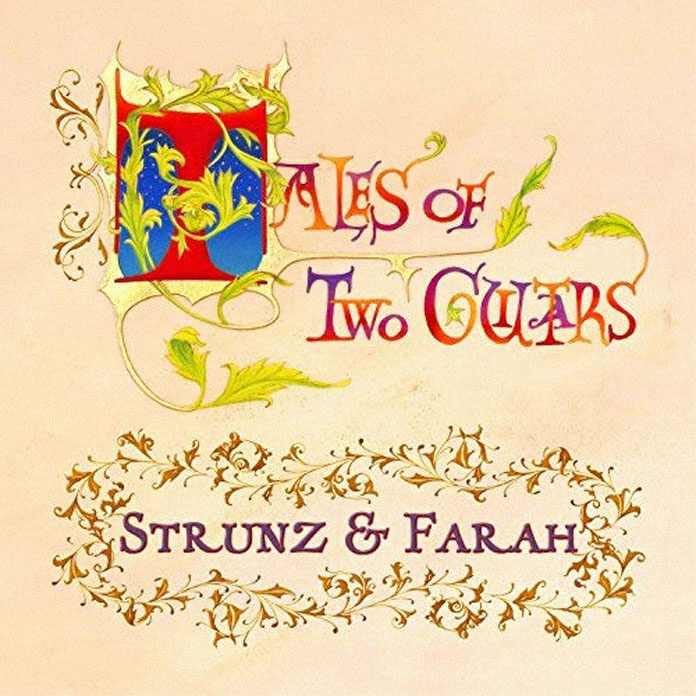 Fluent in many styles – from classical to flamenco and beyond, Strunz and Farah are also multi-faceted and totally seductive. Both are technicians of exceptional elegance and sophistication. Part of this sophistication is their refusal to dazzle beyond the ornamentation for the sake of the music; that is, technique is at all times put to strictly musical ends. The playing of these two musicians puts one in mind of their purported idols – legendary masters from both the classical and the flamenco worlds – who prize the twin virtues of taste and feeling and the heartfelt belief that music should flow like hot oil. Their playing on Tales of Two Guitars – quite strikingly in both halves of this album (which is notionally divided between Middle Eastern/Andalusian and contemporary fusion) is blessedly free of formulaic, metre-driven angularity and stasis that have increasingly beset performances – whether in the studio or on stage – by guitarists who bestride the worlds that Strunz and Farah have dwelled in for decades. Melodic invention is curvaceous, natural and discreetly sensuous; the tonal palette is unfailingly refined. Pick any of these thirteen songs and the ears will not ever be disappointed. Moreover the pervasive polyphony of flamenco, Latin and classical textures is eminently clear but never ostentatious. This may have something to do with being old-fashioned (in the best sense of the term) musicianship. It is also the reason why as celebrated as Strunz and Farah are, they may not be top of mind at all times. But this is a travesty because whenever the two guitarists perform on record or on stage one always gets a truly epic sense of drama in the music. The music of Tales of Two Guitars is no exception. As a friend of the band I commend the author of this review for his insight and veracity. Piquant and prosaic sincerity. Thank you.